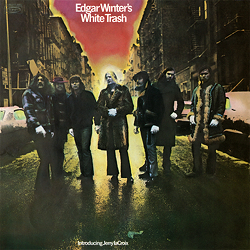 "White Trash" - Edgar Winter (voc, p, org, as, perc); Jerry laCroix (voc, ts, harp); Floyd Radford, Johnny Winter, Rick Derringer (g); Jon Smith (voc, ts); Mike McLellan (voc, tp); George Sheck (b); Bobby Ramirez (dr); a.o. ﻿Question: What is whiter than white? There's only one answer: Winter – Edgar Winter. While his equally pale-faced brother Johnny turned towards black music with a country-blues touch (Columbia KCS 9949 and CS 9826), Edgar was inspired by the traditional big-band sound. The brotherly link paid off, for it freed the talented Edgar from having to make strenuous appearances at night in clubs and gave him the chance to join his older brother in the recording studio. After his successful debut release "Entrance", Winter gathered an all-star band around him and entered the studio to record "White Trash", which landed a smash hit on the US charts. And no wonder – for these soul rockers give everything in a unique mixture of funk, blues and rock 'n' roll. Right from the first number "Give It Everything You Got", a broadly striding rock title with brass, the whole album is bursting with energy and a great atmosphere. Wiry blues with meaty vocals enough to make your hair curl ("I've Got News For You") is followed by the demand – in meaty, snapped phrases – for cheerful rock'n'roll ("Keep Playin' That Rock And Roll"). And let's not forget the sometimes madly intertwined solo parts, where the musicians really let off steam. A true celebration of rock'n'roll.